Early last month, we noted the irony inherent in the fact that Saudi Arabia, whose effort to bankrupt the US shale space has been complicated by the Fed's ZIRP, was set to opportunistically tap the debt market in an effort to offset a painful petrodollar reserve burn. As Bloomberg reports, Qatar is now doing the same, "raising money from local banks as the slump in oil prices buffets the finances of the Middle East’s largest oil and gas exporters." Saudi King Arrives In DC?? Over the past month or so, we’ve spent quite a bit of time detailing the effect the death of the petrodollar has had on Saudi Arabia’s financial position. Recapping briefly, Riyadh’s move to Plaxico itself in an effort to bankrupt the US shale space late last year has forced the kingdom to draw down its petrodollar reserves to ensure that ordinary Saudis aren’t affected by plunging crude. Add in a proxy war (or two) and you get a budget deficit of 20% to go along with the first current account deficit in ages. The cost of maintaining the riyal’s peg to the dollar doesn’t help either. The situation described above has caused the Saudis to tap the debt market to help fill the gap and indeed, some estimates show the country’s currently negligible debt-to-GDP ratio climbing by a factor of 10 by the end of next year. In anticipation of King Salman bin Abdulaziz of Saudi Arabia’s stay, the Four Seasons hotel in Georgetown has done some redecorating — literally rolling out red carpets in order to accommodate the royal’s luxurious taste. Eyewitnesses at the property have seen crates of gilded furniture and accessories being wheeled into the posh hotel over the past several days, culminating in a home-away-from-home fit for the billionaire Saudi monarch, who is in Washington for his first White House meeting with President Barack Obama tomorrow. “Everything is gold,” says one Four Seasons regular, who spied the deliveries arriving at the hotel. “Gold mirrors, gold end tables, gold lamps, even gold hat racks.” Red carpets have been laid down in hallways and even in the lower parking garage, so the king and his family never have to touch asphalt when departing their custom Mercedes caravan. The guests staying at the 222-room hotel for the next couple of days are all part of the 79-year-old king’s entourage of Saudi diplomats, family members and assistants, one source said; a full buyout of the entire property was reserved for the visit. Guests who had booked to stay at the Four Seasons during the royal visit have apparently been moved to other luxury hotels in town. A call to the Four Seasons confirmed the hotel is sold out Thursday, Friday and Saturday nights. King Salman, who ascended the throne in January, has a habit of displacing commoners for his own comforts; this summer, during a sojourn to the French Riviera, his eight-day stay forced the closure of a popular beach, enraging locals. Salman rolls deep, with a reported 1,000-person delegation joining him for his seaside August vacation. Riyadh's involvement in Yemen, where, as we detailed on Thursday, a former US counterterrorism "success story" is now on the verge of splitting into two separate countries. Of course the Iran nuclear deal will also come up, especially in light of the fact that, as The New York Times noted earlier this week, "Republicans are considering legislative options to counter the deal, including the possible reimposition of sanctions the agreement is supposed to lift," now that the President has secured the support he needs to sustain a veto of a GOP challenge. Perhaps more importantly, the two leaders will also discuss Syria and oil prices, with the latter issue now having a rather outsized impact on America's shale producers as well as on US majors' capex plans. Needless to say, the real question from a geopolitical perspective is whether Obama and King Salman come to any closed-door agreements on Syria where, as Al Jazeera delicately puts it, the US and Saudi Arabia are set to orchestrate a "managed political transition." Well, we have a winner - Oil broke to a 3 handle before 10Y rates hit a 1 handle (just - 10Y at 2.04%) following the 5th weekly rise in rig count (+2 to 674). Energy credit risk is soaring to record highs as investors realize 'there will be blood' in all those highly-levered loans. This is the first time the front-month crude contract traded below $40 since March 3rd 2009... just before QE was unleashed in all its asset-inflating, malinvestment-driving, zombifying glory. And then the rig count data hit. and Energy credit risk is exploding.. Persistently low oil prices have already inflicted economic pain on oil-producing countries. But with crude sticking near six-year lows, the risk of political turmoil is starting to rise. Iraq, facing instability from the ongoing fight with ISIS, has seen its problems compounded by the fall in oil prices, causing its budget to shrink significantly. The government is moving to tap the bond markets for the first time in years, looking to issue $6 billion in new debt. Revenues have been bolstered somewhat by continued gains in production. Iraq’s oil output hit a record high in July at 4.18 million barrels per day, up sharply from an average of 3.42 million barrels per day in the first quarter of this year. But with Brent crude now dropping well below $50 per barrel, Iraq’s finances are worsening. According to Fitch Ratings, Iraq may post a fiscal deficit in excess of 10 percent this year, and all the savings accrued during the years of high oil prices have been depleted. Other political problems loom for Iraq. The central government and the semiautonomous region of Kurdistan have been unable to resolve a dispute over oil sales. With revenues running low for the central government, it has failed to transfer adequate funds to the Kurdish Regional Government (KRG). That led to the breakdown of a tenuous deal between the two sides that saw Kurdish oil sold under the purview of the Iraqi government. The KRG is selling oil on its own now in an effort to obtain much needed revenue in order to pay private oil companies operating in its territory. Meanwhile, in southern Iraq, which produces the bulk of the country’s oil and has been far from the violence associated with ISIS, protests have threatened oil operations there. Protests at the West Qurna-2 oilfield operated by Russian firm Lukoil have raised concerns within both the company and the Iraqi central government about disruptions. The Prime Minister even traveled to the site to reassure Lukoil about the stability of its operations. “Recent pressure from villagers and nearby residents making demands could force us to consider halting operations if they keep extorting us,” a Lukoil official reportedly said. Disruptions don’t appear to be imminent, but any cutback in production would be a huge blow to Baghdad and would plunge Iraq deeper into financial despair. Low oil prices could also push Venezuela into a deeper crisis. The cost of insuring Venezuelan government bonds has hit its highest level in 12 years, indicating the growing probability of default. Critical parliamentary elections loom in December, but the government has already cracked down on opposition candidates and will likely prevent a fair election from taking place, even while President Maduro’s popularity sinks. The economy is already in crisis, but it is teetering on the brink of something more acute. Bloomberg’s editors openly wonder whether Venezuela’s neighbors are prepared for its collapse. For Libya, already torn apart by civil war and the growing presence of ISIS militants, low oil prices are the last thing the country needs. ISIS violently crushed a civilian rebellion last week in the coastal city of Sirte, according to Al-Jazeera. Libya’s internationally-recognized government has called upon Arab states for help in fighting ISIS, something that the Arab League has endorsed. Meanwhile, the country’s oil sector – the backbone of the economy – is producing less than 400,000 barrels per day, well below the 1.6 million barrels per day Libya produced during the Gaddafi era. In other words, Libya is selling far less oil than it used to, and at prices far below what they were as recently as last year. Citing IMF data, Bloomberg says that oil is selling for almost $160 per barrel less than what Libya would need it to be for its budget to breakeven. Saudi Arabia does not belong in the same category of troubled countries, but it is also not immune to oil prices at multiyear lows, despite its vast reserves of foreign exchange. Saudi Arabia could run a fiscal deficit that is equivalent to about 20 percent of GDP. To finance public spending, Saudi Arabia has returned to the bond markets for the first time in eight years, issuing 15 billion riyals ($4 billion) in July, only to be followed up by an additional bond offering of 20 billion riyals ($5.33 billion) in August. The government plans on taking on more debt in the coming months as well. Still, Saudi Arabia has a market share strategy that it is pursuing, and there are no signs that it will reconsider. That could spell trouble for much more fragile oil-producing countries around the world. "the most recent plunge has been entirely a function of what now appears to be a global economic recession"
One of the most vocal discussions in the past year has been whether the collapse, subsequent rebound, and recent relapse in the price of oil is due to surging supply as Saudi Arabia pumps out month after month of record production to bankrupt as many shale companies before its reserves are depleted, or tumbling demand as a result of a global economic slowdown. Naturally, the bulls have been pounding the table on the former, because if it is the later it suggests the global economy is in far worse shape than anyone but those long the 10 Year have imagined. Courtesy of the following chart by BofA, we have the answer: while for the most part of 2015, the move in the price of oil was a combination of both supply and demand, the most recent plunge has been entirely a function of what now appears to be a global economic recession, one which will get far worse if the Fed indeed hikes rates as it has repeatedly threatened as it begins to undo 7 years of ultra easy monetary policy. Retreating global equities, bond yields and DM breakevens confirm that EM has company. Much as in late 2014, global markets are going through a significant global growth scare. To illustrate this, we update our oil price decomposition exercise, breaking down changes in crude prices into supply and demand drivers (The disinflation red-herring). Chart 6 shows that, in early July, the drop in oil prices seems to have reflected primarily abundant supply (related, for example, to the Iran deal). Over the past month, however, falling oil prices have all but reflected weak demand. The global outlook has indeed worsened. Our economists have recently trimmed GDP forecasts in Japan, Brazil, Mexico, Colombia and South Africa, while noting greater downside risks in Turkey due to political uncertainty. Asian exports continue to underwhelm, and capital outflows are adding to regional woes. Looking ahead, we still expect the largest DM economies to keep expanding at above-trend pace but global headwinds have intensified. And yet, BofA's crack economist Ethan Harris still expects a September Fed rate hike. Perhaps the price of oil should turn negative (yes, just like NIRP, negative commodity prices are very possible) for the Fed to realize just how cornered it truly is. ...a price not seen since 2009. So what does this mean for S&P 500 earnings in general, and energy earnings in particular? Nothing short of much more pain, if not a complete wipeout, as the following chart - showing energy EPS with a 4 month lag vs oil prices - from Citigroup reveals. ... which after a year of hopium courtesy of central banks, will finally metastasize to the rest of the S&P 500. 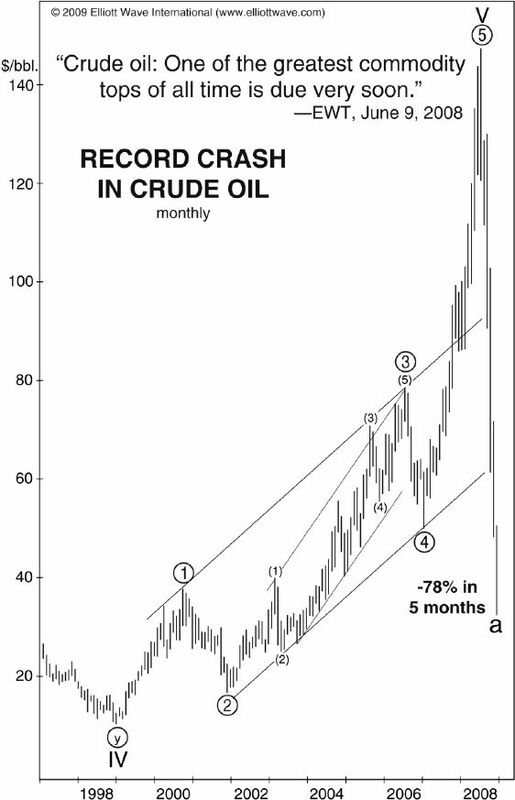 Recall crude oil’s dramatic 2008 price collapse. The high that year was in July at $147.50 a barrel. By December, the price had plummeted to $30.28. This chart shows how Elliott Wave Theorist subscribers were warned ahead of time. Eventually oil did climb back above $100 a barrel. But it took two-plus years, and even then prices remained far below the July 2008 high. Crude traded roughly sideways through June 2014. Then came another nosedive, and about nine months later crude was trading below $44 a barrel. “US oil settles at a six-year low of $43.08 a barrel” (CNBC, Aug. 11). Well, one prominent financial observer has been consistent with his outlook for oil. “Gary Shilling thinks the price of oil is going way lower. The economist and financial analyst wrote an op-ed for Bloomberg View discussing the various reasons why he thinks the price could get down to $10-20 per barrel” (Business Insider, Feb. 17). Time will tell which of these forecasts is correct. People who are afraid that deflation will lead to economic contraction are correct. That’s why the subtitle of Conquer the Crash includes both words: Deflationary Depression. But the trip to the finish line is a zigzag path. Results don’t show up overnight. What’s happening now is nothing compared to what’s coming. Remember "Peak Oil"? About ten years ago, it was a hugely popular theory "explaining" why oil prices would only go higher. They didn't. These excerpts from Robert Prechter's Elliott Wave Theorist highlight the flaws in the conventional approach to forecasting oil prices and show you a better method -- a method that has done a remarkable job forecasting the future path of oil prices. ENERGY - "Far Worse Than 1986"
Total US rig count increased a somewhat stunning 19 last week to 876 - the highest since May. This is the biggest rise in rig count since August 2014. The oil rig count surged 21 to 659 - this is the biggest weekly rise since April 2014. Louisiana (up 7) and Texas (up 8) saw the biggest increases. After yesterday's latest drop in stocks driven by "old economy" companies such as CAT, which sent the Dow Jones back to red for the year and the S&P fractionally unchanged, today has been a glaring example of the "new" vs "old" economy contrast, with futures propped up thanks to strong tech company earnings after the close, chief among which Amazon, which gained $40 billion in after hours trading and has now surpassed Walmart as the largest US retailer. As a result Brent crude is little changed near 2-wk low after disappointing Chinese manufacturing data fueled demand concerns, adding to bearish sentiment in an oversupplied mkt. WTI up ~26c, trimming losses after yday falling to lowest since March 31 to close in bear mkt. Both Brent and WTI are set for 4th consecutive week of declines; this is the longest losing streak for Brent since Jan., for WTI since March. As Bridgewater talks back its now widely discussed bearish position on fallout from China's equity market collapse, Chinese stocks rose at the open (before fading after ugly manufacturing data). However, liquidations continue across the commodity complex in copper, gold, and silver. Though not on the scale to Sunday night's collapse, the China open brought another 'flash-crash' in precious metals. All signs point to CCFD unwinds, and forced liquidations as under the surface something smells rotten in China, which has just been confirmed by the lowest Manufacturing PMI print in 15 months. Across the board commodities are weak again today as CCFD unwinds and mal-investment booms collapse across the world. Copper is under the most pressure today, plunging to its lowest since June 2009... but of course, Dr. Copper now knows nothing about economics because eyeballs trump reality in the new normal... even as Goldman warns lower prices are to come. The forward curve currently points towards a recovery in prices that is far worse than in 1986. As there was no sharp downturn in the ~15 years before that, the current downturn could be the worst of the last 45+ years. If this were to be the case, there would be nothing in our experience that would be a guide to the next phases of this cycle, especially over the relatively near term. In fact, there may be nothing in analysable history. On Tuesday the market got yet another reminder of just how painful the "current commodity price environment" has been for producers when Chesapeake eliminated its common dividend in order to conserve cash. After noting the plunge in Chesapeake’s shares (to a 12-year low) we subsequently outlined why the US shale "revolution" is now running out of lifelines as hedges roll off and as the next round of credit line assessments looms in October. A persistent theme here - as regular readers are no doubt aware - has been the extent to which an ultra-accommodative Fed has contributed to a deflationary supply glut by ensuring that beleaguered producers retain access to capital markets. In short, cash-strapped companies who would have otherwise gone out of business have been able to stay afloat thanks to the fact that Fed policy has herded investors into risk assets. In a ZIRP world, there’s plenty of demand for new HY issuance and ill-fated secondaries, which means the digging, drilling, and pumping gets to continue indefinitely in what may end up being one of the most dramatic instances of malinvestment the market has ever seen. Those who contend that the downturn simply cannot last much longer - that the supply/demand imbalance will soon even out, that the market will clear sooner rather than later, and that even if the weaker hands are shaken out, the pain for the majors will be relatively short-lived - are perhaps ignoring the underlying narrative that helps to explain why the situation looks like it does. At heart, this is a struggle between the Fed’s ZIRP and the Saudis, who appear set to outlast the easy money that’s kept US producers alive. Against that backdrop, and amid Wednesday's crude carnage, we turn to Morgan Stanley for more on why the current downturn will be "worse than 1986." We have been expecting the current downturn to be as severe as the one in 1986 – the worst for at least 45 years – but not worse than that. Still, if oil prices follow the path suggested by the forward curve, our thesis may yet prove too optimistic. Our constructive stance on the majors is based on four factors: 1) supply – we expected production growth to moderate following large capex cuts and the sharp decline in the rig count; 2) demand – we anticipated that the fall in price would boost oil products demand; 3) cost and capex – we foresaw both falling sharply, similar to the industry's response in 1986; and 4) valuation – relative DY and P/BV indicated 35-year lows. So far this year, we can put a tick against three of them [but] our expectation on supply has not materialised: US tight oil production growth has started to roll over, but this has been more than offset by OPEC, which has added ~1.5 mb/d since February. On current trajectory, this downturn could become worse than 1986: An additional +1.5 mb/d is roughly one year of oil demand growth. If sustained, this could delay the rebalancing of oil markets by a year as well. The forward curve has started to price this in: as the chart shows, the forward curve currently points towards a recovery in prices that is far worse than in 1986. This means the industrial downturn could also be worse. In that case, there would be little in analysable history that could be a guide to this cycle. [There are] strong similarities between the current oil price downturn and the one that occurred in 1985/86. The trajectory of oil prices is similar on both occasions. There were also common reasons for the collapse. A high and stable oil price in the preceding four years stimulated technological innovation and led to a high level of investment. This resulted in strong production growth outside OPEC, exceeding the rate of global demand growth. When it became clear that OPEC would no longer rein in production to balance the market (as it did during both the Nov 1985 and Nov 2014 OPEC meetings) the price collapsed. 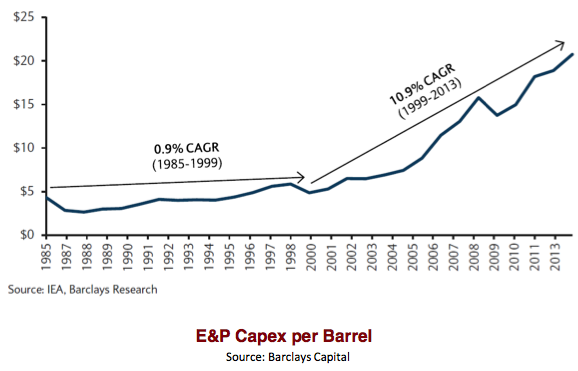 And although MS notes that similar to 1986, costs and capex are likely to come in sharply while demand growth should materialize, the supply side of the equation is not cooperating thanks to increased output from OPEC. Due to the sharp slowdown in drilling activity and the high decline rate of tight oil wells, we expected production in the US to flatline and start declining in 2H. This seems to be happening: according to the US Department of Energy, tight oil production in June was 94 kb/d below the April level, and it forecasts further falls of 90 kb/d in both July and August. Now that capex is falling, we anticipated non-US production to be flat at best. Still, this has not yet been the case. At the time of our 'Looking Beyond the Nadir' report in February, OPEC production stood at ~30.2 mb/d. This increased substantially to 31.3 mb/d in May and 31.7 mb/d in June, i.e. OPEC has added 1.5 mb/d to global supply in the last four months alone. Our commodity analyst Adam Longson argues that the oil market is currently ~800,000 b/d oversupplied. This suggests that the current oversupply in the oil market is fully due to OPEC's production increase since February alone. We anticipated that OPEC would not cut, but we didn't foresee such a sharp increase. In our view, this is the main reason why the rebalancing of oil markets had not yet gained momentum. If oil prices follow the path suggested by the forward curve, and essentially remain rangebound around levels seen in the last 2-3 months, this downturn would be more severe than that in 1986. As there was no sharp downturn in the ~15 years before that, the current downturn could be the worst of the last 45+ years. If this were to be the case, there would be nothing in our experience that would be a guide to the next phases of this cycle, especially over the relatively near term. In fact, there may be nothing in analysable history. Needless to say, this does not bode well for everyone who has unwittingly thrown good money after bad on the assumption that the Saudis will cut production and trigger a rebound in crude. In addition to the immense pressure from persistently low prices, US producers also face a Fed rate hike cycle and thus the beginning of the end for easy money. Of course, the more expensive it is to fund money-losing producers, the less willing investors will be to perpetuate this delay-and-pray scheme, which brings us right back to what we've been saying for months: the expiration date for heavily indebted US drillers is fast approaching, and if Morgan Stanley thinks the oil downturn has no parallel in "analysable history," wait until they see the carnage that will unfold in HY credit when a few high profile defaults in the oil patch send the retail crowd running for the junk bond ETF exits. It looks to me as though we are heading into a deflationary depression, because prices of commodities are falling below the cost of extraction. We need rapidly rising wages and debt if commodity prices are to rise back to 2011 levels or higher. This isn’t happening. Instead, Janet Yellen is talking about raising interest rates later this year, and we are seeing commodity prices fall further and further. Let me explain some pieces of what is happening. 1. We have been forcing economic growth upward since 1981 through the use of falling interest rates. Interest rates are now so low that it is hard to force rates down further, to encourage further economic growth. Figure 1. Chart prepared by St. Louis Fed using data through July 20, 2015. If production is getting increasingly efficient, then we might represent the situation as follows, where the larger size “box” represents the larger output, using the same inputs. Some people might call the situation “diminishing returns,” because the cheap oil has already been extracted, and we need to move on to the more difficult to extract oil. This adds extra steps, and thus extra costs. I have chosen to use the slightly broader term of “increasing inefficiency” because I am not restricting the nature of these additional costs. We don’t have unlimited inputs. 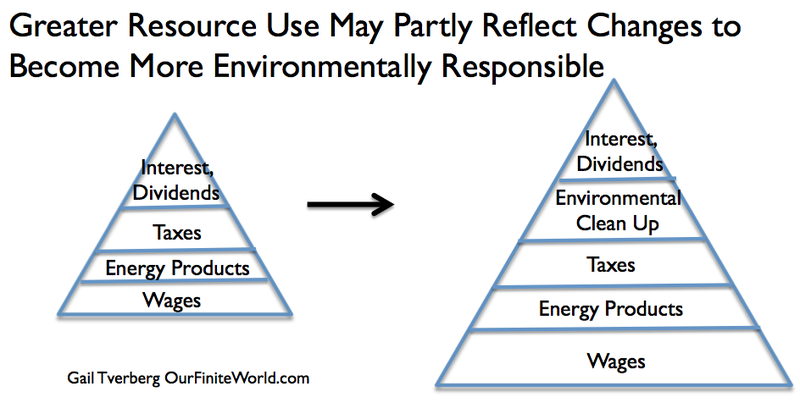 As more and more of our inputs are assigned to creating intermediate products to work around limits we are reaching (including pollution limits), less of our resources can go toward producing desired end products. The result is less economic growth, and because of this declining economic growth, less demand for commodities. Prices for commodities tend to drop. If there is a big increase in costs of products like houses and cars, this presents a huge challenge to workers. Usually, workers pay for these products using a combination of wages and debt. If costs rise, they either need higher wages, or a debt package that makes the product more affordable–perhaps lower rates, or a longer period for payment. 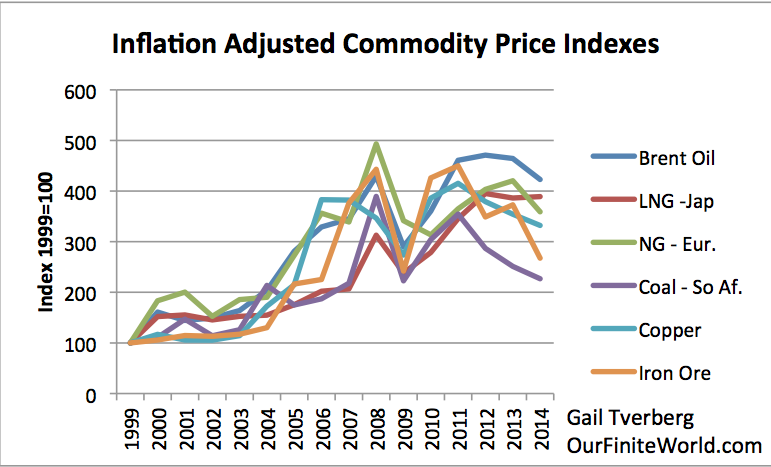 Commodity costs have been rising very rapidly in the last fifteen years or so. According to a chart prepared by Steven Kopits, some of the major costs of extracting oil began increasing by 10.9% per year, about 1999. In fact, the inflation-adjusted prices of almost all energy and metal products tended to rise rapidly during the period between 1999 and 2008 (Figure 7). This was a time period when the amount of mortgage debt was increasing rapidly as lenders began offering home loans with low initial interest rates to almost anyone, including those with low credit scores and irregular income. When buyers began defaulting and debt levels began falling in mid-2008, commodity prices of all types dropped. Figure 6. Inflation adjusted prices adjusted to 1999 price = 100, based on World Bank “Pink Sheet” data. Figure 7. World Oil Supply (production including biofuels, natural gas liquids) and Brent monthly average spot prices, based on EIA data. There is also a logical reason why we would expect that wages would tend to fall as energy costs rise. How does a manufacturer respond to the much higher cost of one or more of its major inputs? If the manufacturer simply passes the higher cost along, many customers will no longer be able to afford the manufacturer’s or service-provider’s products. If businesses can simply reduce some other costs to offset the rise in the cost in energy products and metals, they might be able to keep most of their customers. Figure 9. 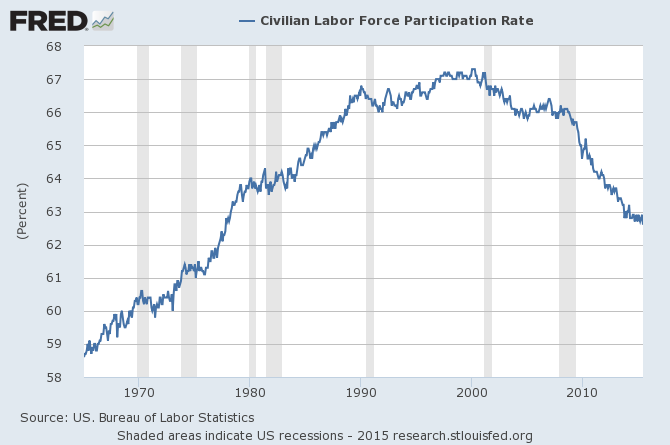 United States Labor Force Participation Rate by St. Louis Federal Reserve. It is computed by dividing the number of people who are employed or are actively looking for work by the number of potential workers. With debt, the big concern is that the oil reserves being used as collateral for loans will drop in value, because of the lower price of oil in the world market. The collateral value of reserves works out to be something like (barrels of oil in reserves x some expected price). Once the value of the collateral drops below the value of the outstanding loan, the borrowers are in big trouble. They may need to sell other assets they have, to help pay down the loan. Or they may end up in bankruptcy. The borrowers certainly can’t borrow the additional money they need to keep increasing their production. Many workers born in the late 1940s and in the 1950s are retiring now. These workers tend to reduce their own spending, and depend on government programs to pay most of their income. Thus, the retirement of these workers tends to drive up government costs at the same time it reduces demand for commodities of all kinds. What we really need is more high wage jobs. Unfortunately, these jobs need to be supported by the availability of large amounts of very inexpensive energy. It is the lack of inexpensive energy, to match the $20 oil and very cheap coal upon which the economy has been built, that is causing our problems. We don’t really have a way to fix this. Figure 1. Daily crude oil prices, June 2014-June 2015. Source: EIA. For oil prices, the phase change was caused mostly by the growth of a new source of supply from unconventional, expensive oil. Expensive oil made sense only because of the longest period ever of high oil prices in real dollars from late 2010 until mid-2014. The phase change occurred also because of a profoundly weakened global economy and lower demand growth for oil. This followed the 2008 Financial Collapse and the preceding decades of reliance on debt to create economic expansion in a world approaching the limits of growth. If the cause of the Financial Collapse was too much debt, the solution taken by central banks was more debt. This may have saved the world from an even worse crisis in 2008-2009 but it did not result in growing demand for oil and other commodities necessary for an expanding economy. Monetary policies following the 2008 Collapse produced the longest period of sustained low interest rates in recent history. As a result, capital flowed into the development and over-production of marginally profitable unconventional oil because of high coupon yields compared with other investments. The devaluation of the U.S. dollar following the 2008 Financial Collapse corresponded to a weak currency exchange rate and an increase in oil prices. The fall in oil prices in mid-2014 coincided with monetary policies that strengthened the dollar. Prolonged high oil prices caused demand destruction. This also allowed the expansion of renewable energy that could compete only at high energy costs. Concerns about global climate change and its relationship to burning oil and other fossil energy threatened the future interests of conventional oil-exporting countries. OPEC hopes to regain market share from expensive unconventional oil and renewable energy, and to renew demand for oil through several years of low oil prices. OPEC increased production in mid-2014, and decided not to cut production at its November 2014 meeting By January 2015 oil prices fell below $50 per barrel. Most observers expected a sharp reduction in U.S. tight oil production after rig counts fell with lower prices. Production fell in early 2015 but recovered as new capital poured into North American E&P companies. This and the partial recovery of oil prices into the mid-$60 per barrel range gave expensive oil another day to survive and fight. If capital continues to flow to unconventional oil companies and OPEC’s resolve stays firm, oil prices could average near the present range for many years. Oil prices will probably fall in the second half of 2015 as the ongoing production surplus and weak demand overcome the sentiment-based belief that a price recovery is already underway. Oil prices must inevitably rise as unconventional production peaks over the next decade and oil-exporting countries increasingly consume more of their own oil. Politically driven supply interruptions will inevitably punctuate the emerging new reality with periods of higher prices. For now, however, we have crossed a boundary and notions of normal or business-as-usual should be put aside. The main cause of the price collapse of 2014-2015 was over-production of oil. Most of the increase came from unconventional production in the United States and Canada–tight oil, oil sands and deep-water oil. From 2008 to 2015, U.S. and Canadian production increased 7.65 million barrels per day (mmpbd). During the same period, non-OPEC production less the U.S. and Canada decreased 2.85 mmbpd and OPEC production increased 1.79 mmbpd (Figure 2). Figure 2 . World liquids production since 2008 and the relative shares for the U.S. & Canada, OPEC and non-OPEC less the U.S. and Canada. North American unconventional and OPEC conventional production increased almost 4 mmbpd in 2014 alone (Figure 3). Figure 3. U.S. + Canada & OPEC Liquids Production Since January 2014. Source: EIA and Labyrinth Consulting Services, Inc. Through 2013, unconventional production growth was matched by decreases in OPEC production mostly from supply interruptions due to political events (Figure 4). The result was that prices remained high despite increases in unconventional production. Figure 4. U.S. + Canada & OPEC Liquids Production Growth, 2011-2015. Source: EIA and Labyrinth Consulting Services, Inc.
OPEC responded to defend its market share in mid-2014 by increasing production. Prices started falling in late June 2014 from $115 per barrel (Brent) and reached a low in late January 2015 of $47 per barrel after OPEC decided not to cut production at its November 2014 meeting. Unconventional production slowed and fell in early 2015. Then, prices increased beginning in February and Brent has averaged $63 per barrel since May 1 (WTI average $59 per barrel). Over-production continues as different parties struggle for market share, for cash flow to survive, or both. If high oil prices created the conditions for unconventional oil to grow and challenge OPEC’s market share, then prolonged low oil prices must be part of OPEC’s solution. By keeping prices below the marginal cost of unconventional production (about $75 per barrel), OPEC hopes that expensive oil production will decline along with the fortunes of the companies engaged in these plays. OPEC is as concerned about long-term demand as it is about market share. Oil is the only major source of revenue for many OPEC countries and low demand, potential competition from other fuel sources, and the effect of a perceived link between oil use and climate change are existential threats. Demand growth for oil has been declining since the late 1960s (Figure 5). OPEC hopes to stimulate demand through low oil prices back to the peak levels that existed before the price shocks of the 1970s and 1980s. Figure 5. World Liquids Demand Growth. Source: BP, EIA and Labyrinth Consulting Services, Inc.
Demand destruction followed periods of high oil prices from 1979-1981 (Iran-Iraq War) and from 2007-2008 (demand growth from China). 2010-2014 was the longest period in history–33 months–of oil prices above $90 per barrel in real dollars (Figure 6). Since 2011, demand growth has fallen to only 0.5% per year so far in 2015 (Figure 5). Figure 6. Crude oil prices more than $90 per barrel in 2015 dollars. Source: EIA, Federal Reserve Board and Labyrinth Consulting Services, Inc. Prolonged low oil prices may restore growth to the global economy accomplishing what the central banks have failed to do since 2008. If successful, interest rates should rise and this may restrict the flow of capital to unconventional E&P companies. Most of the capital provided to these companies comes from high-yield (“junk”) corporate bond sales, preferred share offerings, and debt. In a zero-interest rate world (Figure 7), these provide yields that are are much higher than those found in more conventional investments like U.S. Treasury bonds or money market accounts. If interest rates increase with a stronger economy, capital may flow to more productive investments that offer yields that are more competitive with higher risk tight oil offerings. Figure 7. 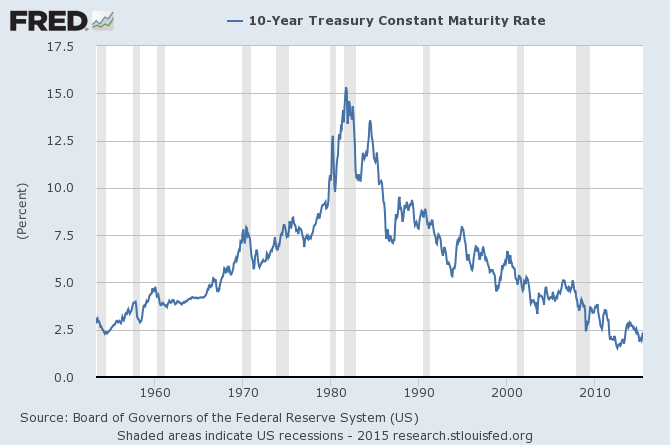 Federal funds interest rates January 2000-June 2015 and Brent crude oil price. Federal Reserve Board, EIA and Labyrinth Consulting Services, Inc. The over-production that began the oil price collapse continues and has gotten worse. The global production surplus (production minus consumption) has gone on for 17 months and has grown from 1.25 mmbpd in May 2014, just before prices began to fall, to almost 3 mmbpd in May 2015 (Figure 8). Figure 8. World liquids production surplus or deficit and Brent crude oil price. Source: EIA and Labyrinth Consulting Services, Inc.
We may take some comfort that the rate of increase has slowed but it is difficult to explain the increase in prices over the last few months based on supply and demand. The production supply surplus that is largely responsible for the current oil-price collapse is not a trivial event that will likely go away soon unless production is cut either by unconventional producers or OPEC. Earlier production surpluses in May 2005 and January 2012 were higher than today but were short-lived and related to specific non-systemic factors (Figure 9). Figure 9. World liquids relative production surplus or deficit and Brent price in 2015 dollars, 2003-2015. 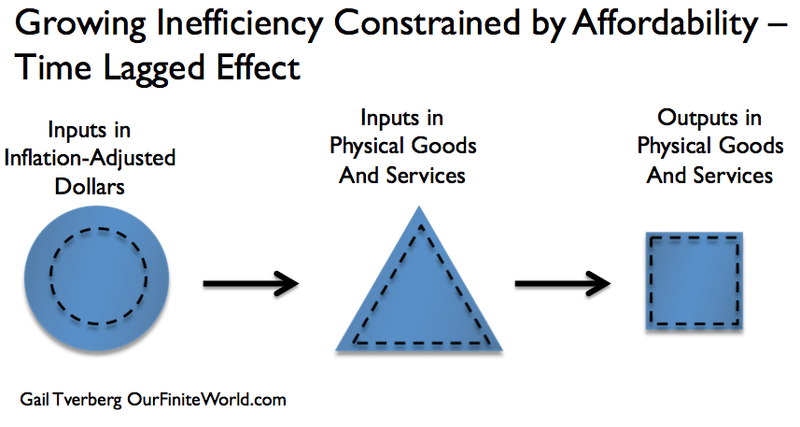 The present supply imbalance is structural and persistent. The only comparable episode in recent history was the production deficit immediately before the 2008 Financial Collapse that lasted 11 months. It was driven by growing Chinese and other Far East demand and by dwindling oil supplies following the peak of conventional production in 2005. For now, OPEC appears committed to continued over-production to achieve its goals. Its production increased 1.4 million barrels of liquids per day during the last year (Figure 3) and some analysts suggest it might increase by an equal amount again in coming months. Meanwhile, U.S. production has not fallen much so far. Production from the main tight oil plays fell about 77,000 bpd in January 2015, was basically flat in February and increased 51,000 bpd in March (Figure 10). This is partly because companies are high-grading well completions in the best parts of the plays. It is also because of the backlog of drilled but uncompleted wells that are being brought on production at a fraction of the incremental cost of drilling new wells. Figure 10. Oil production from tight oil plays in the U.S. Source: Drilling Info and Labyrinth Consulting Services, Inc. But the most significant factor is that capital flow to U.S. unconventional plays has increased. Figure 11 shows that almost $17 billion in equity offerings flowed to U.S. oil companies in the first quarter of 2015, more than in any other period since 2010. The percent of E&P equity rose to over 10% of overall issuance from an average of about 4-5% over the last decade. This can only be explained because there are no alternative investments with comparable yields and that investors believe that they are buying assets that are somehow viable at current oil prices. Figure 11. Capital available to U.S. E&P companies in the first quarter of 2015. Source: Wall Street Journal. Tight oil companies have made the case that through increased efficiency and lower service costs that their economics are better at lower oil prices today than they were at $90 per barrel prices a few years ago. First quarter (Q1) financial results do not support this claim. In fact, tight oil companies are losing more than twice as much money in Q1 2015 as they were in 2014. On average, companies that were spending $1.40 for every dollar they earned from operations last year are now spending $3.20 for every dollar earned (Figure 12). Figure 12. First quarter (Q1) 2015 vs. full-year 2014 capital expenditures-to-cash flow from operations ratio. Source: Google Finance and Labyrinth Consulting Services, Inc. The strength of the U.S. dollar provides a simple and generally reliable way to cut through the complex factors that govern oil prices. A negative correlation exists between the strength of the U.S. dollar and the price of oil (Figure 13). This correlation is particularly strong beginning in about 1997. Figure 13. U.S. Federal Reserve Board broad dollar index and CPI-adjusted Brent and WTI crude oil prices. Source: Federal Reserve Board, EIA and Labyrinth Consulting Services, Inc. The relationship is key to understanding the current oil-price collapse. Figure 14 shows the daily exchange rate of the U.S. Dollar and the Euro in relation to Brent and WTI crude oil prices. The onset of price decline coincided with a stronger U.S. dollar beginning in June 2014 that may be related to the end of quantitative easing and to an improving U.S. economy. The recent increase in oil prices in 2015 corresponds to weakening of the dollar that may reflect disappointingly weak first quarter 2015 U.S. GDP growth. Figure 14. U.S. dollar/Euro exchange rate, Brent and WTI prices. Source: EIA, Oanada and Labyrinth Consulting Services, Inc. The standard explanation for the relationship between the dollar and oil price is that global oil transactions are carried out in U.S. dollars. When the dollar is weak against other currencies, oil prices are higher and when the dollar is strong, oil prices are lower. In other words, a stronger U.S. economy and currency may reduce oil prices and vice versa. While the observation is accurate, the explanation is more complex. Oil and other commodities are hedges against economic risk and uncertainty. Oil prices increase and decrease as risk perception rises and falls. High oil-supply risk or “fear premiums” generally manifest as short-lived, upward price spikes that are quickly integrated into forward price expectations. Following the initial shock of oil-supply risk, U.S. Treasury bond and related “flight-to-safety” investments tend to lower oil price trends as the U.S. dollar appreciates. Supply and demand balance operates as a first-order cycle against which economic uncertainty and geopolitical risk fluctuate as second- and third-order cycles. When a first-order supply imbalance coincides with second- or third-order economic or geopolitical factors, an upward or downward price-cycle may develop. Higher energy costs are a weight on the economy that may lower currency values. 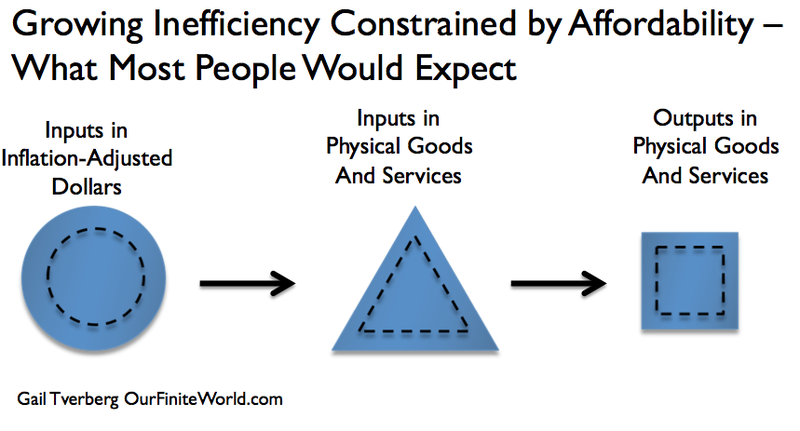 Conversely, lower energy costs may lift the economy and currency values. The U.S. is the world’s largest economy and the U.S.dollar is the world reserve currency. This makes the U.S. dollar a fairly reliable reflection and measure of all of these factors. The 2014-2015 oil price collapse may be understood then as a supply surplus that occurred at a time of a strengthening U.S. economy (low economic uncertainty) and relatively low geopolitical risk (Figure 15). The additive effect of these three cycles was a sharp decline in oil prices. Figure 15. World liquids production or surplus, Brent price and U.S. dollar index. Source: EIA, Federal Reserve Board and Labyrinth Consulting Services, Inc.
Are Low Oil Prices Long or Short Term? Oil price collapses in 1981-1986 and 2008-2009 are the only analogues for the present price situation (Figure 16). So far, the current price collapse seems more similar to 1981-1986 than to 2008-2009.
non-OPEC oil production, oil consumption and Brent crude oil price in 2014 U.S. dollars. Source: BP, EIA and Labyrinth Consulting Services, Inc.
1981-1986 was a long-term event. The price collapse itself lasted for 5 years but oil prices remained below $90 per barrel in real dollars until 2007, almost 27 years. 2008-2009 was a short-term event. Prices began falling in July 2008 and reached a low point in December 2008. Prices recovered and reached $90 per barrel in April 2010 and $100 per barrel in March 2011. Then entire cycle from $90 per barrel and back again lasted a little more than 2 years. The oil price collapse of the 1980s was similar to the present price collapse because the primary cause was a new source of supply. Non-OPEC production exceeded OPEC production in 1978 as new supply from the North Sea (U.K. and Norway), western Siberia (Russia), the Campeche Sound (Mexico) and China came on line. Unlike the present, the new supply was inexpensive conventional oil. Oil prices had increased in 1979-1981 to more than $90 per barrel in real dollars because of supply interruptions at the beginning of the Iran-Iraq war. This caused approximately 4.3 mmbpd of demand destruction. Lower demand and continued supply growth from non-OPEC countries caused a production surplus beginning in 1982. Although neither the volume of new supply or the amount of demand destruction during the current price collapse are as great as 1981-1986, they are more similar than to 2008-2009. 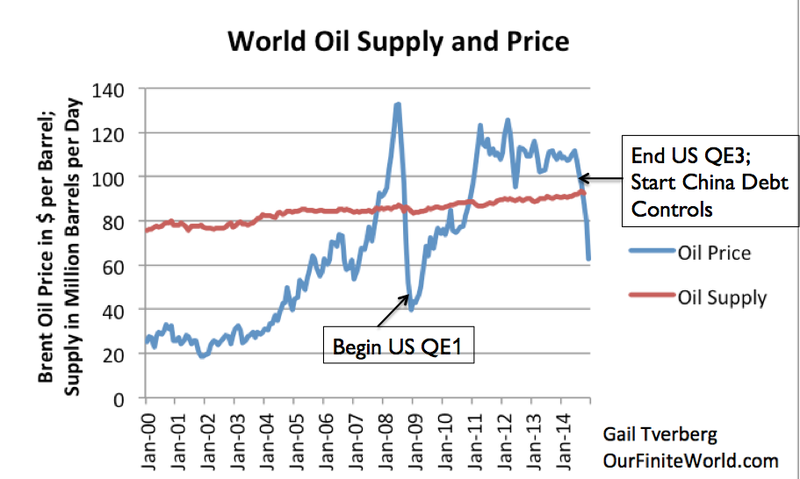 The 2008-2009 oil price collapse was part of an overall crash of the entire global economy. High oil prices in 2007 and 2008 were due to a large and persistent production supply deficit because of high demand from China and the Far East, and dwindling supplies following the peak of conventional oil production in 2005 (Figures 15 and 17). The surplus had nothing to do with new supply but was completely due to decreased demand from a collapsing global economy. The surplus only lasted for 6 months and never approached the level seen in 2014-2015 (an OPEC production cut in early 2009 limited the length of the surplus and possibly its magnitude). Figure 17. World liquids production surplus of deficit (12-month moving average) and Brent oil price. Source: EIA and Labyrinth Consulting Services, Inc.
High oil prices preceding the 2014-2015 price collapse began because of supply interruptions resulting from the Arab Spring. Brent price reached a maximum of $129 per barrel in April 2011 at the height of the Libyan Civil War. These events corresponded with a period of U.S. currency devaluation following the 2008 Financial Collapse and an extraordinarily weak U.S. dollar (Figures 13 and 15). The additive effects of a supply deficit, economic uncertainty and geopolitical risk resulted in high oil prices. Case histories neither predict the present or the future but offer guidelines. These two case histories simply suggest is that the present period of low oil prices is more similar to that of the 1980s and 1990s than to that of the 2008-2009 period. That similarity means that the current phenomenon is likely to be a relatively long-term event. The availability of capital to fund unconventional production is the key to how long low oil prices will last going forward. If the flow of capital continues, then the production surplus and lower oil prices will also continue, assuming that OPEC is able to maintain higher production levels and that demand growth remains relatively low. Eventually, price will win and unconventional production will fall. The market will rebalance and prices will rise. If oil prices stay low for long enough, demand will increase to support those higher prices. I doubt that prices will increase to levels before mid-2014 barring politically driven shock events. $90 per barrel appears to be the empirical threshold price above which demand destruction begins. It is more difficult to predict how the second- and third-order effects of economic uncertainty and geopolitical risk may affect supply and demand fundamentals and, therefore, price. These are the wild cards that could change the outcome that I describe. The most likely case is that oil prices will decrease in the second half of 2015 and that financial distress to all oil producers will increase. The hope and expectation that the worst is over will fade as the new reality of prolonged low oil prices is reluctantly accepted. We have had a year of lower oil prices. Based on available data, I see no end in sight yet. The market must balance before things get better and prices improve. That can only happen if production falls and demand increases. That will take time. We have crossed a boundary and things are different now. "The Fed is a reluctant Dollar bull," explains Goldman Sachs, noting that Yellen inadvertently revealed the FOMC's expectation that coming policy changes will boost the greenback. Broadly speaking the rest of the sell-side has herded along into the strong US Dollar camp with only Unicredit (rate shift may slow recent very strong USD momentum) and Morgan Stanley (suggesting USD corrective activity) backing away from full dollar bull though most suggest adding to dollar longs on any dip as the most crowded trade in the world gets crowded-er. 1. Price action around the last FOMC was jarring. The drop in the Dollar in the immediate aftermath of the meeting was greater than during the “no taper” surprise in September 2013 (Exhibit 1) and conviction that the USD can rally from here has taken a beating. We have a different take and continue to see large upside for the Dollar. Our reasoning is simple. On the surface, there is no denying that last week was a dovish shift, no doubt in response to the sharp rise in the Dollar in the run-up to the meeting. But what does that shift really signal? In our minds, it is an implicit admission that the normalization of monetary policy – a return to data dependence and lift-off – will boost the Dollar. Last week’s actions thus inadvertently revealed the Fed’s expectations for the greenback, which are that coming policy changes will likely boost the Dollar. In a sense, last week was reminiscent of the SNB’s decision to de-peg in January. That action implicitly signaled an expectation that the Euro could weaken a lot more, making the peg increasingly unsustainable. That “forecast revision,” made in the run-up to the ECB's QE, has of course been borne out. Like the rest of us, central banks have implicit currency views, though in the case of the Fed we have to infer those from actions rather than words. Last week’s switch from “patient” to “not impatient” signaled that normalization is coming, but a reluctance to do so in June, for fear that Dollar strength will get out of hand. The Fed is a reluctant Dollar bull. 2. Of course, it is quite possible that the pace of Dollar appreciation slows from that seen since Chair Yellen’s Humphrey-Hawkins testimony (Exhibit 2). But that is hardly a heroic statement. The Dollar has seen outsized gains versus the majors recently, which – as discussed in our last FX Views – reflect Dollar positioning that was too pessimistic (it felt to us like the market was expecting a repeat of the kind of weak data we saw a year ago) and rising focus on “patient” coming out of the FOMC statement. It is perfectly normal for the Dollar to consolidate after such a move. Indeed, following large moves, the USD has tended to trade sideways for several weeks at a time. This time is no different most likely, i.e. this is not the end of the bull-run for the Dollar. 3. There is no doubt that the hurdle has risen for labor market data, which Chair Yellen highlighted in giving the FOMC “reasonable confidence.” But it is also important to remember the bigger picture. The bulk of the Dollar rise has been the Euro and Yen weakness, a reflection of regime change at the BoJ and ECB that pushed the 2-year differential sharply in favor of the Dollar (Exhibit 3). This is why, in our minds at least, the Dollar has been resilient to relatively mixed data in recent months. As such, the hurdle for the Dollar is not really all that high after all. There is an additional facet to this. Last week, Chair Yellen talked back the removal of “patient,” downplaying a June lift-off by saying the Fed would “not be impatient.” Forward guidance, in other words, did not quite leave this time around. Its full removal is another Dollar positive catalyst, which we believe should see the 2-year differential converge further towards the forwards, boosting the Dollar (Exhibit 4). 4. We know we may sound like perma-Dollar bulls. We are not. There will be a turning point, but in our minds that will come once we have gone a lot further towards normalization. Markets will inevitably front-run monetary policy normalization, so the turn will likely come before the Fed funds target reverts to its historical average. But is that moment at hand, before the Fed has been able to fully let go of forward guidance, let alone lift-off? We think not. *FISCHER SAYS DOLLAR WON'T KEEP RISING FOREVER. USD weakness continues today but unlike last week the move today was on much lighter flows. We were net better sellers of USD across the board but I think some of that is position reduction given the high level of realized vol we’ve seen. EURUSD has had at least a 125bp move day/day the last 4 sessions. Will be interesting to see if the USD rally can reignite once things calm down because recent FED speak continues to emphasize that a rate hike could come mid-year. The financial world focuses far too much on stocks. The stock market, despite being at record highs (meaning record market capitalizations) remains one of the smallest, and least sophisticated markets on the planet. Consider that stocks, even at current lofty levels, have a global market capitalization of slightly over $60 trillion. In contrast, the global bond market is well over $100 trillion. And the global currency market trades OVER $5.3 trillion per day. It is currencies, not stocks, where the most significant moves occur. The currency markets are the largest, most liquid markets in the world. They are always first to move when things change. Stocks are the DUMB money compared to currencies. Everyone should care, because, globally, the world is awash in borrowed money… most of it in US Dollars. When you BORROW in US Dollars you are effectively SHORTING the US Dollar. So when the US Dollar rallies… you have to cover your SHORT or you blow up. I’ve written before about this problem. Last month I projected that the US Dollar carry trade (borrowing in US Dollars to finance other investments) was the largest carry trade in the world. At that time I believed the US Dollar carry trade is believed to be north of $3 trillion. I was WRONG… WAY, WAY WRONG. It’s MANY MULTIPLES LARGER THAN THAT. Off-shore lending in US dollars has soared to $9 trillion and poses a growing risk to both emerging markets and the world's financial stability, the Bank for International Settlements has warned. The US Dollar carry trade is north of $9 trillion… literally than the economies of Germany and Japan COMBINED. And the US Dollar is rallying… HARD. The fact that Oil is imploding at the same time this happens is not coincidence. Oil producers and explorers were financing their projects using what? BORROWED DOLLARS. This is going to begin seeping into emerging markets and other assets soon. Imagine what the world would look like if $9 trillion worth of shorted Dollars had to be covered? Imagine the SELL PRESSURE this would induce in all other assets. 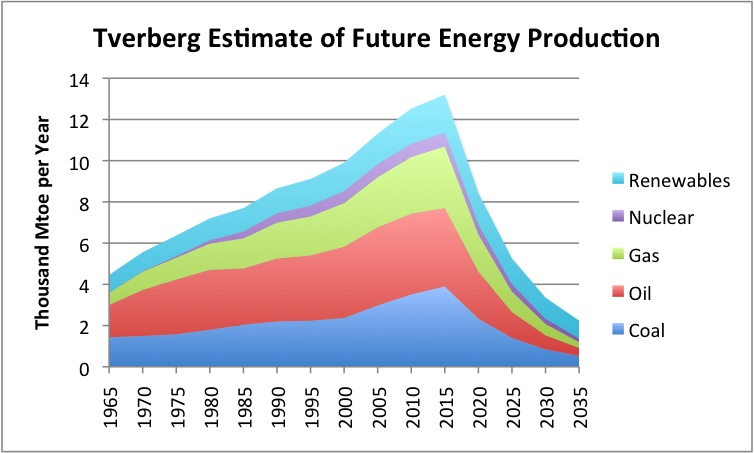 Peak oil: the possibility that oil prices will rise, and because of this production will fall in a rounded curve. Substitutes that are possible because of high prices will perhaps take over. Debt related collapse: oil limits will play out in a very different way than most have imagined, through lower oil prices as limits to growth in debt are reached, and thus a collapse in oil “demand” (reallyaffordability). The collapse in production, when it comes, will be sharper and will affect the entire economy, not just oil. In my view, a rapid drop in oil prices is likely a symptom that we are approaching a debt-related collapse - in other words, the second of these two problems. Underlying this debt-related collapse is the fact that we seem to be reaching the limits of a finite world. There is a growing mismatch between what workers in oil importing countries can afford, and the rising real costs of extraction, including associated governmental costs. This has been covered up to date by rising debt, but at some point, it will not be possible to keep increasing the debt sufficiently. The price of oil is crashing – and with good reason. Supply is surging, while demand is weak. Moreover, within just a few decades, new technologies, including solar and probably hydrogen fuel cells, will make oil completely obsolete. Anyone born after the middle of this century will probably never know the smell of gasoline. The price of oil fell by $10 a barrel last week. It’s now down 40% since June. This oil price plunge will have a significant impact on the global economy, so it is important to consider both its causes and its potential consequences. SHALE OIL: There are three main causes. First and foremost is shale oil. Thanks to the shale oil revolution, the United States is now producing almost 9 million barrels per day, the most in 30 years. By the end of next year, US production will be approaching 10 million barrels per day. So, even with most Iranian oil off the market due to sanctions, and with Iraqi oil production at somewhere near a quarter of what it could have been had there been peace in that country during the last decade, global output is increasing sharply. According to the International Energy Agency (IEA), global supply was 93.8 million barrels per day (mb/d) in September this year, up 2.8 mb/d from one year earlier. WEAK GLOBAL DEMAND: The second reason is that global demand for oil is weak. Demand from China is growing much more slowly than had been anticipated due to the economic slowdown there. US demand for oil is actually declining – in large part due to government regulations requiring improved fuel efficiency standards for cars. Furthermore, global economic growth is weak and there has been a very sharp slowdown in the growth in global trade. The IEA estimates global oil demand will be 92.4 mb/d this year and 93.6 mb/d in 2015. GEO-POLITICAL CLASH: In addition to supply and demand factors, I believe there may also be a third reason for this oil price crash: the desire of the United States to punish Russia for supporting pro-Russian separatists in the Ukraine. Russia is one of the world’s largest oil producers. Russian government finances depend heavily on oil sales. Therefore, the drop in oil prices is a severe blow to Russia. I believe it is well within the power of the United States government to push down the price of oil by selling oil futures short. The lack of transparency or oversight within the $700 trillion Over-The-Counter derivatives market would permit the US government to do this without being noticed. Since this tool is available to US policymakers (and perhaps this is just the kind of situation that explains why the government has not imposed transparency on this market), no one should be surprised that they would employ it. How long it remains low. Since we don’t know the answers to those questions, let’s focus on the consequences if the oil price stabilizes where it is now, at $68 per barrel for Brent. CONSUMER "TAX CUT": Consumers will be better off. Lower gasoline prices will be like a tax cut for the middle class, who will be able to spend more on other goods. SMALLER US TRADE DEFICIT: The US trade deficit will become smaller as the cost of oil imports falls (although this will be partially offset since Americans are likely to use their savings from a lower gasoline bill to buy more consumer goods made overseas). A lower trade deficit will boost GDP. SHIFT IN CENTRAL BANK STANCES: Lower oil prices will mean more downward pressure on consumer prices and a greater risk of deflation. The fear of deflation is likely to cause the Fed and the Bank of England to delay their plans to increase interest rates, while it may force the European Central Bank and the Bank of Japan to accelerate their asset purchases. LOWER SOVEREIGN BOND YIELDS: In most countries, government bond yields have already fallen in response to the increasing disinflationary/deflationary pressures that will result from lower oil prices. Government bond yields in a number of European countries fell to record lows last week. SOVEREIGN FISCAL PRESSURES: The finances of the oil exporting countries will suffer. The currencies of Russia, Norway, Venezuela and Nigeria have already fallen significantly, reflecting the deterioration in those countries’ economic prospects. PRODUCTION BREAKEVEN COSTS: Lower oil prices are likely to put some high cost producers out of business. Canadian oil sands look particularly vulnerable. Some of the marginal shale oil producers in the US may also go to the wall. As bankruptcies occur, defaults on energy junk bonds are likely to rise significantly. At this stage, I don’t believe that the losses in the junk bond market will be significant enough to cause a new financial sector crisis. Nor do I believe that so many wells will shut down in the United States that US oil production will begin to fall. Production costs have been falling rapidly and are likely to continue falling. Oil prices will have to fall considerably further before most of the new shale oil production becomes unprofitable. Of course, the possibility that oil will fall much further can’t be ruled out. It was $20 per barrel not all that long ago. REDUCED CAPITAL FLOWS: Finally, the reduction in the US trade deficit will mean a reduction in capital inflows into the US. (Capital inflows are the mirror image of the Current Account Deficit, since every country’s balance of payments must balance.) The reduction in capital inflows will reduce the upward pressure on US asset prices that has come from this source in the past. This has been an exciting few weeks in the oil markets and the drama could increase during the weeks ahead. But just imagine the extraordinary upheavals that will occur (in the markets and in geopolitics) when the realization eventually sets in that new technologies will make oil practically worthless sometime before the middle of this century. That realization still appears to be some time off, however. Between now and then, we are likely to see a number of other big swings in the price of oil, both up and down. The $316bn figure would be much higher if other big oil exporters including Russia, Norway, Mexico, Kazakhstan and Oman are taken into account. SHIFT IN INVESTMENT PATTERNS: The main impact of the reduction of petrodollar flows will be less on liquidity than on investment patterns. What a sovereign wealth fund might put their money into will be different to what an asset manager might favour. The flow of Opec petrodollars into global financial markets is set to dry up as the collapse in the oil price delivers a $316bn hit to the cartel’s revenues. Big oil producers have pumped the windfall they enjoyed from soaring oil prices over the last decade into a huge range of global assets, from US Treasuries and high-grade corporate bonds to equities and real estate. Qatar, for example, bought the Harrods department store and Paris Saint-Germain, France’s top football club, while Abu Dhabi’s sovereign wealth fund bought a stake in the glitzy Time Warner building in New York. The flow of petrodollars into the global financial system boosted liquidity, spurred asset prices and helped to keep borrowing costs down. But the 40 per cent fall in Brent crude since mid-June will reverse this trend, as the shrinkage of the oil producers’ cash pile removes a pillar of support for global markets. “This is the first time in 20 years that Opec nations will be sucking liquidity out of the market rather than adding to it through investments,” David Spegel, global head of emerging market sovereign and corporate research at BNP Paribas. BNP estimates that if oil production remains at its current level and oil prices stay at about $70 a barrel for the next year, Opec nations will receive $316bn less in oil export revenues than if oil prices were at their three-year average of $105. George Abed, director for Africa and the Middle East at the Institute of International Finance, said at their peak in 2012, Opec petrodollar flows into liquid investments such as US Treasuries, high-grade corporate bonds and equities stood at $500bn. Next year, they could drop below $100bn if prices average $78 a barrel, he said. This “comes on top of other trends that seem to be sucking liquidity out of the global system”, he said. One of the key factors in the slowing flow of petrodollars is the surge in US oil production. The US is importing less oil than it used to, meaning fewer dollars are being sent abroad: some analysts have said this could lead to a shortfall in dollar liquidity. Oil prices have fallen amid a surge in US shale production and weakening oil demand in China. Brent slipped further last week after Opec decided not to cut output to shore up prices. George Magnus, economic adviser to UBS, said the main impact of the reduction of petrodollar flows will be less on liquidity than on investment patterns as wealth is transferred from oil-producing countries to consumer nations such as Japan that benefit from a lower oil price. “What a sovereign wealth fund might put their money into will be different to what an asset manager might favour. We should expect a lot of churn,” he said. Jason Shoup, analyst at Citigroup, said that the decline in petrodollar growth was “likely to equate to less demand” for bonds. The shift could also have some bearing on when borrowing costs for governments, companies and consumers start to rise. With consumers spending more, the withdrawal of the Federal Reserve’s quantitative easing programme could become “that much more palpable,” he said. However, Alan Ruskin at Deutsche Bank downplayed the impact of petrodollars on US markets as less Opec money has been flowing into the country in recent years. In a note to clients, he said the size of annual inflows of petrodollars into US dollar and asset markets was “modest relative to total cross-border flows”. But if stressed oil producers are forced to sell assets to fund gaps in their domestic budgets, that “could in theory be a good deal messier”, he said. Although some countries with huge foreign-exchange reserves such as Saudi Arabia are better able to withstand the pain from lower oil prices, others such as Venezuela will only suffer more if crude prices fall. Pierre Andurand, a prominent oil hedge fund manager, said that oil prices could drop to $60 a barrel next year. "First, it is an outlier, as it lies outside the realm of regular expectations, because nothing in the past can convincingly point to its possibility. Second, it carries an extreme 'impact'. Third, in spite of its outlier status, human nature makes us concoct explanations for its occurrence after the fact, making it explainable and predictable." 1. How many analysts/pundits predicted the 37% decline in the price of oil, from $105/barrel in July to $66/barrel at the end of November? Perhaps somebody predicted a 37% drop in oil in the span of five months, but if so, I haven't run across their prediction. The mechanism is common-sense: every additional dollar that must be spent on energy is taken away from spending on other goods and services. As consumption tanks, over-extended borrowers and lenders implode, "risk-on" borrowing and speculation dry up and the economy slides into recession. 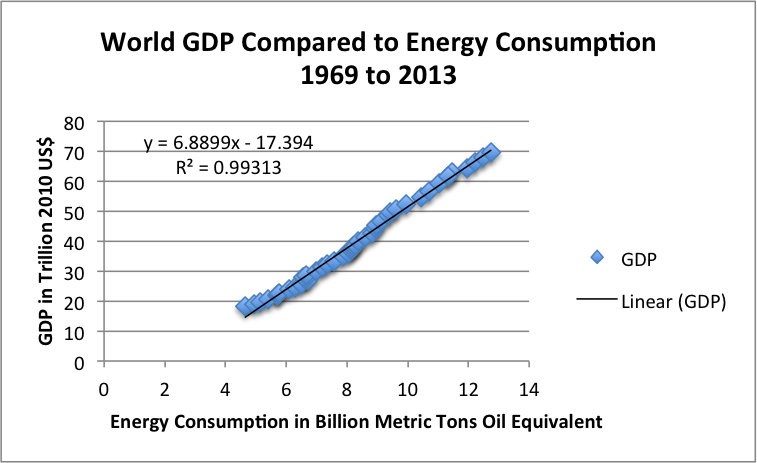 As for the drop in oil having a major impact: we have barely begun to feel the full consequences. But even the initial impact--the domino-like collapse of the commodity complex--qualifies. Given the presumed 17% to 20+% expansion of the global economy since 2009, the small increases in production could not possibly flood the world in oil unless demand has cratered. The "we're pumping so much oil" rationalizations for the 37% free-fall in oil don't hold up. That leaves a sharp drop in demand and the rats fleeing the sinking ship exit from "risk-on" trades as the only explanations left. We will discuss these later in the week. Every sustained action has more than one consequence. Some consequences will appear positive for a time before revealing their destructive nature. Some will be foreseeable, some will not. Some will be controllable, some will not. Those that are unforeseen and uncontrollable will trigger waves of other unforeseen and uncontrollable consequences." I call your attention to the last line, which I see as being most relevant to the full impact of oil's free-fall.